Kurt Williams, special effects supervisor of the Fantastic Four movie, said that the Human Torch is "one of the most challenging characters I've ever done" to bring to life. "We have to bring a flaming man onto the screen that doesn't look animated," Williams said. "It has to feel like he's really on fire. "In order to do that, we've had to create different stages of his development, where, in the very beginning of the movie, he snaps his fingers and flame shoots up. It stars very small, and that's going to feel like an actual flame element that doesn't necessarily take over his body. "Later on, as his skills become more refined, he has to actually create heat and the flame has to come off his body as a result. So what we're doing is that we're creating various layers and those are base layers combined in those images. We've got about six or seven layers we can put in any one shot depending on its intent, how hot he's getting. "When he goes super nova, it's going to be very white hot. What happens is the heat will come off his hands, for instance, and like a solar flare off of the sun, as it lives off the hot surface, in the case of Johnny, that heat will be exposed to oxygen and then will create flame, just out from the surface of his hand." In other FF news, 20th Century Fox has provided The Continuum with a new promotional image from the film. Click on the thumbnail for a larger image. Look for more on Fantastic Four soon here in The Continuum. Warner Bros. has provided The Continuum with a look at the international poster for Batman Begins. Following the release of the domestic and international posters, a new trailer will debut in theaters only on Friday, although there have been reports of it being attached to Blade: Trinity's Wednesday opening. It will be attached to the big Warner Bros. release Ocean's Twelve as well as select prints of Blade: Trinity. 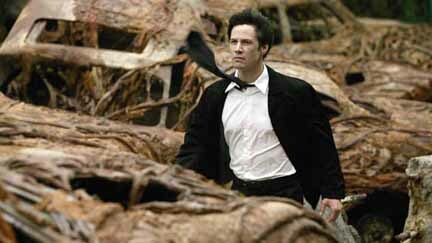 A Warner Bros. representative told The Continuum the filmmakers wanted the trailer to be seen on the big screen initially. The trailer will officially be online on Monday. The film stars Christian Bale as Bruce Wayne/Batman; Michael Caine as his trusted butler Alfred; Liam Neeson as Wayne's mentor, Henri Ducard; Katie Holmes as Rachel Dawes, a childhood friend of Wayne's; Gary Oldman as Lieutenant James Gordon, a detective on the Gotham police force; Cillian Murphy as Dr. Jonathan Crane; Tom Wilkinson as Falcone; Rutger Hauer as the CEO of Wayne Enterprises; Ken Watanabe as the villanous Ra's Al Ghul; and Morgan Freeman as Lucius Fox, a former board member and sidelined employee of Wayne Enterprises. The trailer features a lot of Bruce Wayne's training with Ducard and includes an upside-down Batman scaring a bad guy that was shown at Wizard World Chicago. Click on the thumbnail for a larger image of the poster, and for coverage of Murphy's only convention appearance, CLICK HERE. Look for more on Batman Begins very soon here in The Continuum. Constantine: HBO First Look, at behind-the-scenes special of the Warner Bros. picture based on the DC Comics title Hellblazer, will debut on HBO on Tuesday, Feb. 1 at 10:45 p.m.
Like most HBO First Look specials, Constantine's will be 13 minutes. Other air dates for Constantine: HBO First Look include Sunday, Feb. 6 at 11:45 a.m.; Wednesday, Feb. 9 at 6:45 p.m.; Friday, Feb. 11 at 1:45 p.m.; Saturday, Feb. 12 at 6 p.m.; Tuesday, Feb. 15 at 10:45 p.m.; and Thursday, Feb. 24 at 10:45 p.m.
* Director Francis Lawrence said that Constantine star Keanu Reeves has a little in common with the film's title character. "He's a great guy, but he's a dark guy," Lawrence said. "He's haunted and he can sort of draw on that and make it work. It's fascinating how some of the themes and philosophies of this movie, it really attracted people. He definitely believes in the way this movie works and is sort of angry about some of the rules of the way the world works. And I think that is a key." * The new trailer for the movie is now in theaters. * Constantine was featured on Access Hollywood this week. "Fantastical situations with really human connections," Reeves said about the film. * For The Continuum's coverage of the Constantine panel at Comic-Con International in San Diego, CLICK HERE. Blade: Trinity opened to $5.5 million at the box office on Wednesday, Variety reported. The film opened in 2,912 venues. Both previous Blade films opened No. 1 at the box office; Blade brought in $17 million in August 1998 and Blade II launched with $35.2 million in March 2002. Blade: Trinity will be hard-pressed to keep the streak alive with the Friday opening of Ocean's Twelve. The star-powered film from Warner Bros. opens in 300 more theaters. * Jessica Biel, who plays Abigail Whistler, will be a guest on NBC's The Tonight Show with Jay Leno on Friday. * The film was featured on TV Guide Channel's What's On Flix. "Wesley Snipes, I think he is a true master of action," said Ryan Reynolds, who plays Hannibal King. 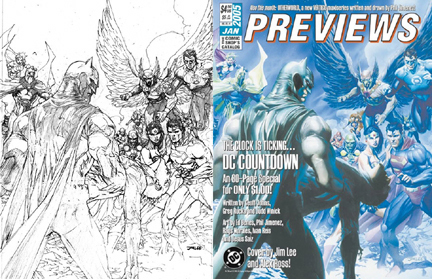 On his blog, artist Jim Lee has released the Previews cover artwork by him and Alex Ross for Countdown, presumably a big event DC Comics has planned for March. "Soooooooo I guess the image is out. Been having to keep this under my hat for some time now. Yep, the second cover that I collaborated on with Mr. Alex Ross and once again, he delivers the goodies. I already like how the fans are speculating who Batman is holding...but good luck. "This puppy has a million things built-in to throw you off. (Can't make it that obvious --duh. Unfortunately the original was GIGANTIC and had to scan it in two parts. Our studio scanner was on the fritz so the lower half did not capture the gray tones for some reason. "Still, was fun to draw so many DC heroes assembled on one piece and of course, Alex shines an incredible light onto it all. Very ethereal. I like how he improved upon Green Lantern and Hawkman the best." According to the Previews cover, Countdown is an 80-page special that will cost $1. Contributors include writers Geoff Johns, Greg Rucka and Judd Winick, and artists Ed Benes, Phil Jimenez, Rags Morales, Ivan Reis and Jesus Saiz. Look for the complete DC solicitations for March on Monday at 5 p.m. (ET) here in The Continuum. Cable & Deadpool #10, arriving in stores on Wednesday, wraps up "The Burnt-Offering" story arc and includes a Cable vs. Silver Surfer fight. The Continuum: If you were a movie director pitching this issue, what would you say? Nicieza: I would say I need an extra fifty million for the budget. (laughs) Seriously, "The Burnt-Offering" finale climaxed story threads that have been running not just for the first ten issues of our book, but in many ways since Cable first appeared. Having Cable and the Silver Surfer duke it out for the future of the human race gave the entire story the escalating scope and scale it warranted. This issue also makes a very emphatic and definitive statement about who Cable is... and what he might become. The Continuum: How important is this issue to the title? Nicieza: Knock on wood, but in five years people can look back on CDP #10 and say, "Wow, they REALLY knew what they were doing all along, didn't they? This issue was not just an ending, it was also a beginning." The Continuum: Can you talk about Patrick Zircher's art? He's handling a lot of characters in this issue. Nicieza: Patrick is great. I mean, just terrific. He is such a skilled storyteller; he juggles multiple characters, world-hopping scene changes, military hardware, Chinese temples and small apartment buildings, bombastic big explosions and subtle nuance, over-the-top jokes and silent side glances between characters. He always adds tremendously to every issue from ideas to dialogue. He choreographs fights scenes so well, he cuts my workload in half. I love working with him and hope he gets a lot more very well-deserved attention. But not so much more that he's offered a better gig! The Continuum: Where does the book go from here? Nicieza: The beauty of this book is that it can -- and will -- go anywhere we want it to! The climax of "The Burnt-Offering" leads to "Thirty Pieces," which is Deadpool's search to save Cable's life while very important people are trying to stop him. These two issues guest-star the Fixer from Thunderbolts and Agent X. After that, we have a 2-issue "Law and Order" episode called "A Murder in Paradise," wherein Deadpol gets to play detective. And starting with issue #15, we have what could be our best storyline to date. All I can say right now is the title and let people figure it out from there. It will be called "Enema of the State." Guess who is the enema? `Nuff said! The Luna Bros. -- writer Joshua and plotter/artist Jonathan -- have provided The Continuum with a preview of Ultra #5, out on Wednesday from Image Comics. The issue is part five of the "Seven Days" story. "It's very hard to say anything without ruining this issue," Jonathan Luna told The Continuum. "All I can say is that this issue has quite a big twist." The series will continue to parody magazine covers through its eight-issue run, with #6 modeled after Vogue, #7 after People and #8 after comics in general. Jonathan Luna said he is pleased with the growth of Ultra's readership. "I just found out that we're in the top 200 comics (173) of October," he said. "Pretty good for a new book and art team, huh?" Ultra #5 will be 32 pages and will cost $2.95. Click on the thumbnails above for larger images. Harris Comics has announced the promotion of Assistant Editor Bon Alimagno to the position of Editorial Director, stepping in for outgoing Editor-in-Chief Maureen McTigue. Alimagno started at Harris as an intern from New York University and transitioned to the Assistant Editor position after graduating. Since then he's helped facilitate several aspects of the Harris Comics operation -- everything from customer service to general editorial. "Bon's been a vital part of Harris for a while now," said Executive Publisher Jonathan Rheingold. "He has a passion for comics that will lead our characters and publications in exciting directions." Harris Comics publishes comics fearuring Vampirella and Vampirella Comics Magazine. Under its Anarchy Studios imprint, Harris serves as publisher for manga characters Vampi and Xin. Kristin Kreuk, who plays Lana Lang in Smallville, and Shawn Ashmore, who played Bobby Drake in the two X-Men movies and guest-starred on two episodes of Smallville, are starring in Earthsea, a new mini-series on SciFi. They were part of a premiere event earlier this week in New York. Jae Lee is providing the art for The Incredible Hulk #82. The Daredevil movie will be part of Cinemax's "Extended Time Out" event on Sunday, Feb. 6, the day of the Super Bowl. The film will air at 6 p.m. Daredevil will also air on the pay cable network on Thursday, Feb. 10 at 2:45 p.m.; Tuesday, Feb. 15 at 5 p.m.; Sunday, Feb. 20 at 8 p.m.; and Monday, Feb. 28 at 1 p.m.
* For Saturday, Dec. 4, include Blade: Trinity and Batman Begins movie news, CLICK HERE. * For Friday, Dec. 3, include DVD news, CLICK HERE. * For Thursday, Dec. 2, include DVD news, CLICK HERE.